Lanark Bridge, to repair, Bill. 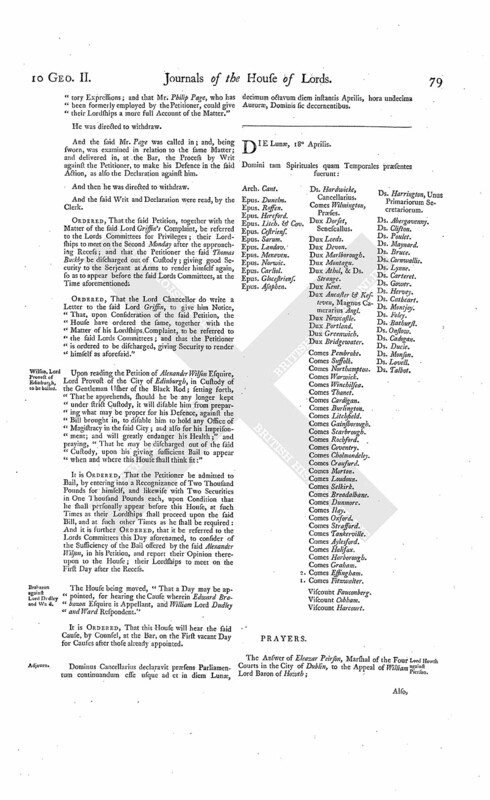 With a Bill, intituled, "An Act to enable the Magistrates and Town Council of the Borough of Lanark to repair and maintain their Bridge over the River Clyde, at Clydsholm, in the Shire of Lanark;" to which they desire the Concurrence of this House. New Sarum Streets, &c. Paving Bill. 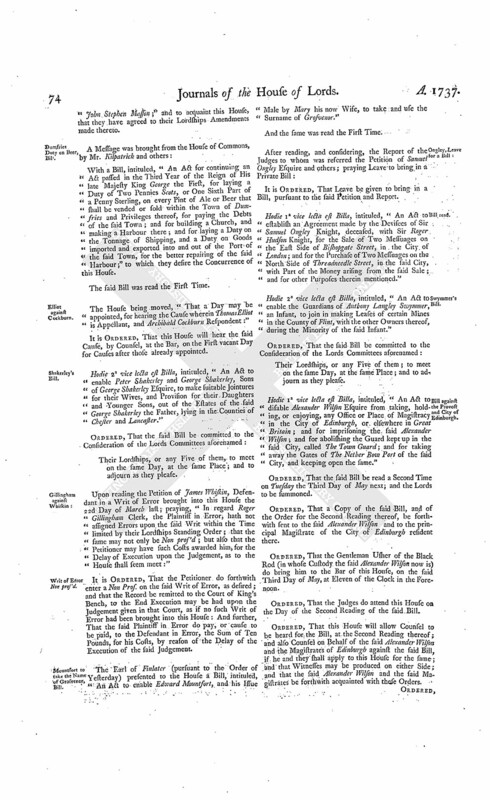 With a Bill, intituled, "An Act for the better repairing and paving the Highways, Streets, and Watercourses, within the City of New Sarum; and enlightening the Streets, Lanes, and Passages, and better regulating the Nightly Watch within the said City;" to which they desire the Concurrence of this House. The House was informed, "That the Parties in the Cause wherein Thomas Lee Gentleman is Appellant, and Agnes Southwell and others are Respondents, were come to an Agreement; and that the Appellant was desirous his Appeal might be dismissed without Costs, and the Decree of the Court of Chancery in Ireland, appealed from, affirmed." And the Respondents Agent acquainting the House, He was authorized to consent to what was desired by the Appellant:"
Ordered, That the said Appeal be dismissed accordingly. The House being informed, "That Robert Lyons attended at the Door, with a Transcript of a Record from the Exchequer Chamber in Ireland, upon a Writ of Error returnable before this House;"
He was thereupon called in; and attested upon Oath, at the Bar, "That he examined the said Transcript with the original Record in the said Exchequer Chamber; and that the same was a true Copy." And having delivered in the said Transcript to the Clerk, he was directed to withdraw. In which Writ of Error, Hugh Montgomery Esquire is Plaintiff, and Charles Dempsy Lessee of the Reverend Charles Dodd Clerk Defendant. It was moved, "To resolve, That it appears to this House, that, on the Seventh of September last, there was a most seditious and outrageous Riot in the City of Edinburgh, notoriously concerted and carried on by great Numbers of wicked, disorderly, and bloodthirsty Persons, who did, with open Force and Violence, seize the Arms of the City Guard, possess themselves of the City Gates, and, by setting Fire to and breaking open the Door of The Talbooth of the said City, did, unlawfully and audaciously, rescue and set at large several Criminals therein confined; and that Captain John Porteous, then a Prisoner there under Sentence of Death, but graciously reprieved by the Queen's most Excellent Majesty as Guardian of the Realm, was, by the said Rioters, in a cruel Manner, dragged from the said Prison, and, under the Shew of a mock Execution, most barbarously murdered, in manifest Violation of the public Peace, in Defiance and Subversion of legal Government, in high Contempt of our Sovereign Lord the King and His Laws, and to the most presumptuous and unparalleled Obstruction of the Royal Mercy." Then it was moved also, "To resolve, That, upon Consideration of the said Report, it appears to this House, that Alexander Wilson Esquire, then and now Lord Provost of the City of Edinburgh, did not take any Precautions to prevent the said Murder and Riot; nor did use the proper or necessary Means to suppress the same, or to preserve the Peace of the said City; or to discover, apprehend, or secure, the Authors, Actors, or Abettors, of the said notorious Murder and Riot, in manifest Violation of the Trust and Duty of his Office of Chief Magistrate of the said City; and the said Alexander Wilson thereby appears to be guilty of a high Crime and Misdemeanor." It was proposed, "At the Close thereof, to leave out these Words; (videlicet,) ["And the said Alexander Wilson thereby appears to be guilty of a high Crime and Misdemeanor."]." Then the Resolution, as proposed, except those Words, was agreed to. Ordered, That the Gentleman Usher of the Black Rod attending this House, his Deputy or Deputies, do forthwith attach the Body of the said Alexander Wilson, and keep him in safe Custody until further Order of this House; and this shall be a sufficient Warrant on that Behalf. Then it was moved likewise, "To resolve, (fn. 1) That, upon Consideration of the said Report, (fn. 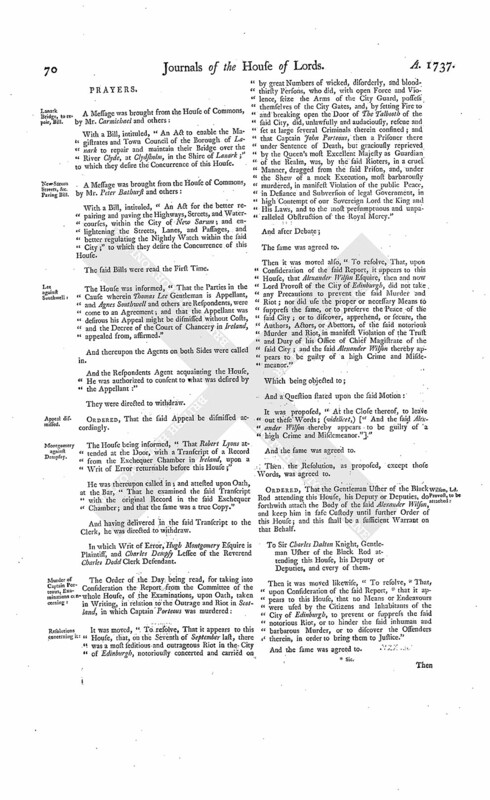 1) that it appears to this House, that no Means or Endeavours were used by the Citizens and Inhabitants of the City of Edinburgh, to prevent or suppress the said notorious Riot, or to hinder the said inhuman and barbarous Murder, or to discover the Offenders therein, in order to bring them to Justice." Then it was proposed, "To order, that a Bill be brought in, to disable the said Alexander Wilson from taking, holding, or enjoying, any Office or Place of Magistracy, in the City of Edinburgh, or elsewhere in Great Britain; and for imprisoning him for a certain Time, to be limited in the said Bill." The Question was put, "Whether a Bill shall be brought in, pursuant to the said Motion?" Ordered, That the Judges do prepare and bring in a Bill accordingly; and do insert therein a Clause, or Clauses, for abolishing the Guard kept up in the said City, called The Town Guard; and for taking away the Gates of The Nether Bow Port of the said City, and laying open the same. Ordered, That an humble Address be presented to His Majesty, "That He will be graciously pleased to order the proper Officer, or Officers, to lay before this House, an Account of the Names of all such Persons as have been declared fugitive, for being guilty of the said Riot or Murder; and of all such other Persons as have been charged by proper Informations with being concerned therein, and are fled from Justice." Bill to prevent Riots in Scotland, to be brought in. Ordered, That the Judges do prepare, and bring in, a Bill for the more effectual preventing and punishing Riots and Tumults in that Part of Great Britain called Scotland; and for the more easy Discovery and Conviction of Rioters, more especially in the Cases of breaking Prisons, opposing or disturbing the Execution of Justice, clandestine Running of uncustomed or prohibited Goods, and assaulting or resisting the Officers of His Majesty's Revenue in the Execution of their Officers. Dominus Cancellarius declaravit præsens Parliamentum continuandum esse usque ad et in diem Lunæ, quartum diem instantis Aprilis, hora undecima Auroræ, Dominis sic decernentibus. New Sarum, paving, &c. Bill. Hodie 2a vice lecta est Billa, intituled, "An Act for better repairing and paving the Highways, Streets, and Water-courses, within the City of New Sarum; and for enlightening the Streets, Lanes, and Passages, and better regulating the Nightly Watch within the said City." Viscount Fauconberg. L. Ap. Cant. Hodie 1a vice lecta est Billa, intituled, "An Act for Sale of Part of the Estate of Daniel late Earl of Winchilsea and Nottingham, deceased, for Payment of Debts and Encumbrances charged upon and affecting the same; and for other Purposes therein mentioned." The Lord Chief Justice of the Court of Common Pleas (pursuant to the Order of Friday last) delivered in a Bill, prepared by the Judges, intituled, "An Act to disable Alexander Wilson Esquire from taking, holding, or enjoying, any Office or Place of Magistracy in the City of Edinburgh, or elsewhere in Great Britain; and for imprisoning the said Alexander Wilson; and for abolishing the Guard kept up in the said City, called The Town Guard; and for taking away the Gates of The Nether Bow Port of the said City, and keeping open the same." Ordered, That the said Bill be read the First Time To-morrow; and the Lords to be summoned. Hodie 1a vice lecta est Billa, intituled, "An Act to enable Peter Shakerley and George Shakerley, Sons of George Shakerley Esquire, to make suitable Jointures for their Wives, and Provision for their Daughters and Younger Sons, out of the Estates of the said George Shakerley the Father, lying in the Counties of Chester and Lancaster." 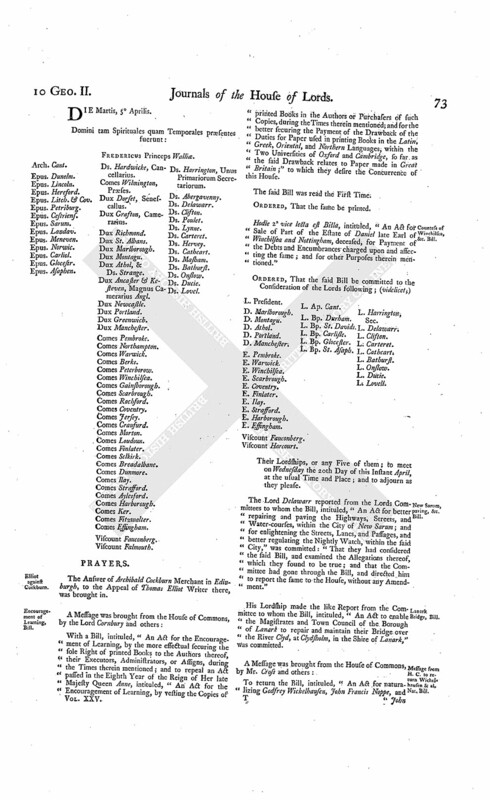 After reading, and considering, the Report of the Judges to whom was referred the Petition of William and Henry Swymmer; praying Leave to bring in a Private Bill. Hodie 1a vice lecta est Billa, intituled, "An Act to enable the Guardians of Anthoney Langley Swymmer, an Infant, to join in making of Leases of certain Mines in the County of Flint, with the other Owners thereof, during the Minority of the said Infant." Hodie 2a vice lecta est Billa, intituled, "An Act to enable the Magistrates and Town Council of the Borough of Lanark to repair and maintain their Bridge over the River Clyd, at Clydsholm, in the Shire of Lanark." Edgworth against Edgworth & al. And an Objection being made, and it appearing to the House, "That Robert Edgworth, the Appellant's Son, was not made a Party to the Suit:"
It is Ordered and Adjudged, by the Lords Spiritual and Temporal in Parliament assembled, That the said Order of the said Court of Exchequer, complained of in the said Appeal be, and is hereby, reversed; and that the Respondents be at Liberty to amend their Bill, by making proper Parties thereto, paying the Costs of the Day of Hearing in the said Court, according to the Custom of that Court: And it is hereby further Ordered, That the said Court proceed in the said Cause, according to Justice, and without any unnecessary Delay. Mountfort to take the Name of Grosvenor, Leave for a Bill. King's Answer to Address for Names of Fugitives on account of Capt. Porteous's Murder. 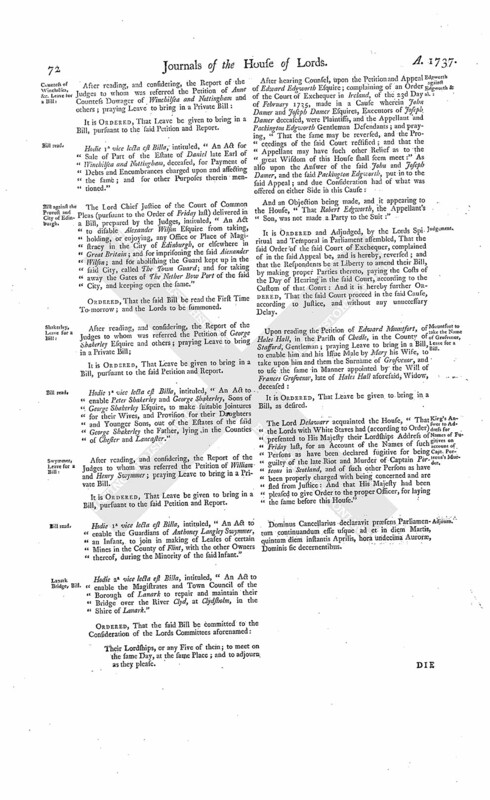 The Lord Delawarr acquainted the House, "That the Lords with White Staves had (according to Order) presented to His Majesty their Lordships Address of Friday last, for an Account of the Names of such Persons as have been declared fugitive for being guilty of the late Riot and Murder of Captain Porteous in Scotland, and of such other Persons as have been properly charged with being concerned and are fled from Justice: And that His Majesty had been pleased to give Order to the proper Officer, for laying the same before this House." Dominus Cancellarius declaravit præsens Parliamentum continuandum esse usque ad et in diem Martis, quintum diem instantis Aprilis, hora undecima Auroræ, Dominis sic decernentibus. The Answer of Archibald Cockburn Merchant in Edinburgh, to the Appeal of Thomas Elliot Writer there, was brought in. 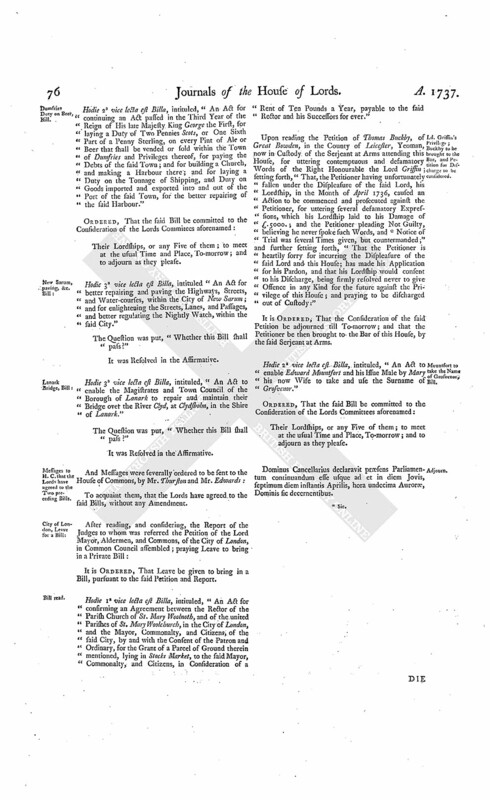 With a Bill, intituled, "An Act for the Encouragement of Learning, by the more effectual securing the sole Right of printed Books to the Authors thereof, their Executors, Administrators, or Assigns, during the Times therein mentioned; and to repeal an Act passed in the Eighth Year of the Reign of Her late Majesty Queen Anne, intituled, "An Act for the Encouragement of Learning, by vesting the Copies of printed Books in the Authors or Purchasers of such Copies, during the Times therein mentioned; and for the better securing the Payment of the Drawback of the Duties for Paper used in printing Books in the Latin, Greek, Oriental, and Northern Languages, within the Two Universities of Oxford and Cambridge, so far as the said Drawback relates to Paper made in Great Britain;" to which they desire the Concurrence of this House. Countess of Winchilsea, &c. Bill. Hodie 2a vice lecta est Billa, intituled, "An Act for Sale of Part of the Estate of Daniel late Earl of Winchilsea and Nottingham, deceased, for Payment of the Debts and Encumbrances charged upon and affecting the same; and for other Purposes therein mentioned." Viscount Harcourt. L. Ap. Cant. Their Lordships, or any Five of them; to meet on Wednesday the 20th Day of this Instant April, at the usual Time and Place; and to adjourn as they please. The Lord Delawarr reported from the Lords Committees to whom the Bill, intituled, "An Act for better repairing and paving the Highways, Streets, and Water-courses, within the City of New Sarum; and for enlightening the Streets, Lanes, and Passages, and better regulating the Nightly Watch, within the said City," was committed: "That they had considered the said Bill, and examined the Allegations thereof, which they found to be true; and that the Committee had gone through the Bill, and directed him to report the same to the House, without any Amendment." His Lordship made the like Report from the Committee to whom the Bill, intituled, "An Act to enable the Magistrates and Town Council of the Borough of Lanark to repair and maintain their Bridge over the River Clyd, at Clydsholm, in the Shire of Lanark," was committed. Message from H. C. to return Wichelhausen & al. Nat. Bill. To return the Bill, intituled, "An Act for naturalizing Godfrey Wichelhausen, John Francis Noppe, and John Stephen Masson;" and to acquaint this House, that they have agreed to their Lordships Amendments made thereto. Dumfries Duty on Beer, Bill. With a Bill, intituled, "An Act for continuing an Act passed in the Third Year of the Reign of His late Majesty King George the First, for laying a Duty of Two Pennies Scots, or One Sixth Part of a Penny Sterling, on every Pint of Ale or Beer that shall be vended or sold within the Town of Dumfries and Privileges thereof, for paying the Debts of the said Town; and for building a Church, and making a Harbour there; and for laying a Duty on the Tonnage of Shipping, and a Duty on Goods imported and exported into and out of the Port of the said Town, for the better repairing of the said Harbour;" to which they desire the Concurrence of this House. The House being moved, "That a Day may be appointed, for hearing the Cause wherein Thomas Elliot is Appellant, and Archibald Cockburn Respondent:"
Hodie 2a vice lecta est Billa, intituled, "An Act to enable Peter Shakerley and George Shakerley, Sons of George Shakerley Esquire, to make suitable Jointures for their Wives, and Provision for their Daughters and Younger Sons, out of the Estates of the said George Shakerley the Father, lying in the Counties of Chester and Lancaster." Upon reading the Petition of James Whiskin, Defendant in a Writ of Error brought into this House the 22d Day of March last; praying, "In regard Roger Gillingham Clerk, the Plaintiff in Error, hath not assigned Errors upon the said Writ within the Time limited by their Lordships Standing Order; that the same may not only be Non pros'd; but also that the Petitioner may have such Costs awarded him, for the Delay of Execution upon the Judgement, as to the House shall seem meet:"
It is Ordered, That the Petitioner do forthwith enter a Non Pros. on the said Writ of Error, as desired; and that the Record be remitted to the Court of King's Bench, to the End Execution may be had upon the Judgement given in that Court, as if no such Writ of Error had been brought into this House: And further, That the said Plaintiff in Error do pay, or cause to be paid, to the Defendant in Error, the Sum of Ten Pounds, for his Costs, by reason of the Delay of the Execution of the said Judgement. The Earl of Finlater (pursuant to the Order of Yesterday) presented to the House a Bill, intituled, An Act to enable Edward Mountfort, and his Issue Male by Mary his now Wife, to take and use the Surname of Grosvenor." Hodie 1a vice lecta est Billa, intituled, "An Act to establish an Agreement made by the Devisees of Sir Samuel Ongley Knight, deceased, with Sir Roger Hudson Knight, for the Sale of Two Messuages on the East Side of Bishopgate Street, in the City of London; and for the Purchase of Two Messuages on the North Side of Threadneedle Street, in the said City, with Part of the Money arising from the said Sale; and for other Purposes therein mentioned." 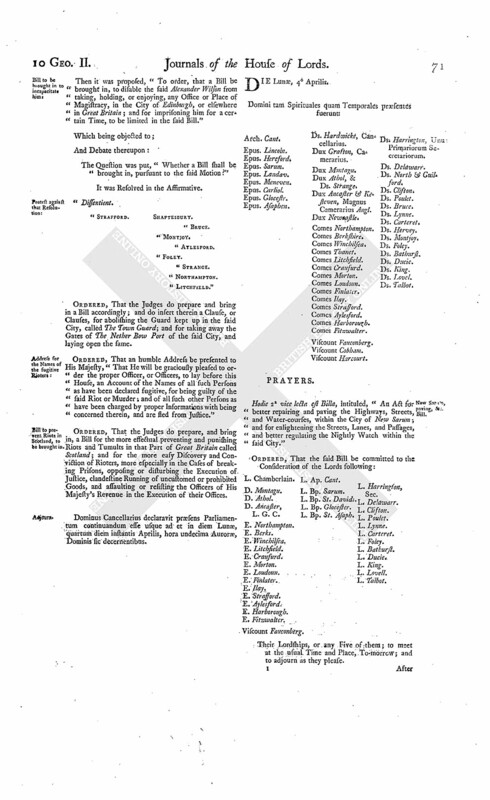 Hodie 2a vice lecta est Billa, intituled, "An Act to enable the Guardians of Anthony Langley Swymmer, an Infant, to join in making Leases of certain Mines in the County of Flint, with the other Owners thereof, during the Minority of the said Infant." Hodie 1a vice lecta est Billa, intituled, "An Act to disable Alexander Wilson Esquire from taking, holding, or enjoying, any Office or Place of Magistracy in the City of Edinburgh, or elsewhere in Great Britain; and for imprisoning the said Alexander Wilson; and for abolishing the Guard kept up in the said City, called The Town Guard; and for taking away the Gates of The Nether Bow Port of the said City, and keeping open the same." Ordered, That the said Bill be read a Second Time on Tuesday the Third Day of May next; and the Lords to be summoned. Ordered, That a Copy of the said Bill, and of the Order for the Second Reading thereof, be forthwith sent to the said Alexander Wilson and to the principal Magistrate of the City of Edinburgh resident there. Ordered, That the Gentleman Usher of the Black Rod (in whose Custody the said Alexander Wilson now is) do bring him to the Bar of this House, on the said Third Day of May, at Eleven of the Clock in the Forenoon. Ordered, That the Judges do attend this House on the Day of the Second Reading of the said Bill. 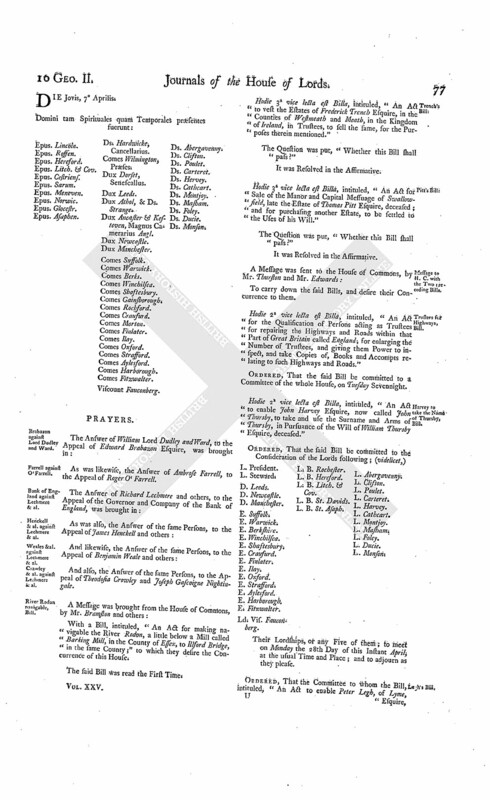 Ordered, That this House will allow Counsel to be heard for the Bill, at the Second Reading thereof; and also Counsel on Behalf of the said Alexander Wilson and the Magistrates of Edinburgh against the said Bill, if he and they shall apply to this House for the same; and that Witnesses may be produced on either Side; and that the said Alexander Wilson and the said Magistrates be forthwith acquainted with these Orders. Ordered, That His Majesty's Attorney General have forthwith Notice of the said Orders. Dominus Cancellarius declaravit præsens Parliamentum continuandum esse usque ad et in diem Mercurii, sextum diem instantis Aprilis, hora undecima Auroræ, Dominis sic decernentibus. Harvy to take the Name of Thursby, Bill. With a Bill, intituled, "An Act to enable John Harvey Esquire, now called John Thursby, to take and use the Surname and Arms of Thursby, in Pursuance of the Will of William Thursby Esquire, deceased;" to which they desire the Concurrence of this House. 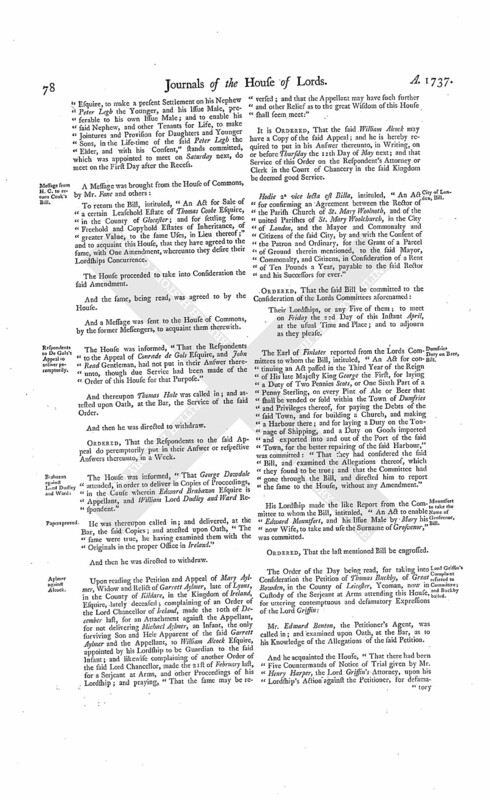 With a Bill, intituled, "An Act for the Qualification of Persons acting as Trustees for repairing the Highways and Roads within that Part of Great Britain called England; for enlarging the Number of Trustees, and giving them Power to inspect and take Copies of Books and Accompts relating to such Highways and Roads;" to which they desire the Concurrence of this House. The Lord Bathurst reported from the Lords Committees to whom the Bill, intituled, "An Act for Sale of the Manor and Capital Messuage of Swallowfield, late the Estate of Thomas Pitt Esquire, deceased; and for purchasing another Estate, to be settled to the Uses of his Will," was committed: "That they had considered the said Bill, and examined the Allegations thereof, which they found to be true; that the Parties concerned had given their Consents; and that the Committee had gone through the Bill, and made some Amendments thereunto." 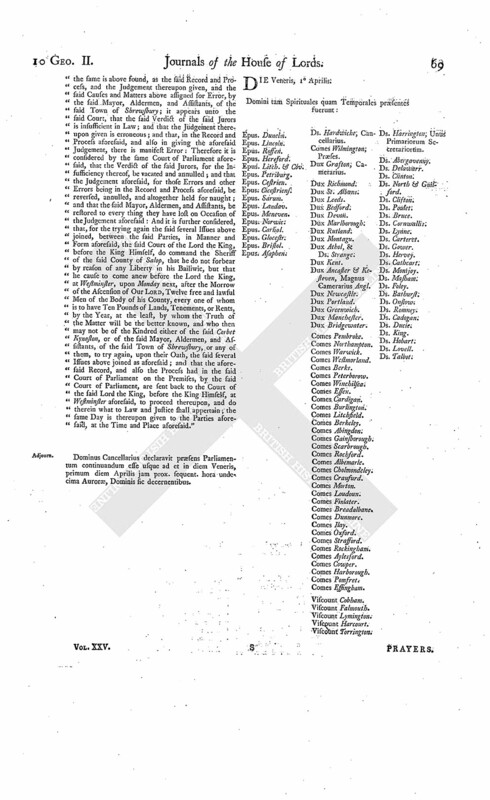 The Lord Clifton made the like Report from the Committee to whom the Bill, intituled, "An Act to vest the Estates of Frederick Trench Esquire, in the Counties of Westmeath and Meath, in the Kingdom of Ireland, in Trustees, to sell the same, for the Purposes therein mentioned," was committed. Hodie 2a vice lecta est Billa, intituled, "An Act to establish an Agreement made by the Devisees of Sir Samuel Ongley Knight, deceased, with Sir Roger Hudson Knight, for the Sale of Two Messuages on the East Side of Bishopgate Street, in the City of London; and for the Purchase of Two Messuages on the North Side of Threadneedle Street, in the said City of London, with Part of the Money arising from the said Sale; and for other Purposes therein mentioned." L. Viscount Cobham. L. Ap. Cant. Their Lordships, or any Five of them; to meet on Thursday the 21st Day of this Instant April, at the usual Time and Place; and to adjourn as they please. Hodie 2a vice lecta est Billa, intituled, "An Act for continuing an Act passed in the Third Year of the Reign of His late Majesty King George the First, for laying a Duty of Two Pennies Scots, or One Sixth Part of a Penny Sterling, on every Pint of Ale or Beer that shall be vended or sold within the Town of Dumfries and Privileges thereof, for paying the Debts of the said Town; and for building a Church, and making a Harbour there; and for laying a Duty on the Tonnage of Shipping, and Duty on Goods imported and exported into and out of the Port of the said Town, for the better repairing of the said Harbour." Hodie 3a vice lecta est Billa, intituled "An Act for better repairing and paving the Highways, Streets, and Water-courses, within the City of New Sarum; and for enlightening the Streets, Lanes, and Passages, and better regulating the Nightly Watch, within the said City." Hodie 3a vice lecta est Billa, intituled, "An Act to enable the Magistrates and Town Council of the Borough of Lanark to repair and maintain their Bridge over the River Clyd, at Clydsholm, in the Shire of Lanark." Hodie 1a vice lecta est Billa, intituled, "An Act for confirming an Agreement between the Rector of the Parish Church of St. Mary Woolnoth, and of the united Parishes of St. Mary Woolchurch, in the City of London, and the Mayor, Commonalty, and Citizens, of the said City, by and with the Consent of the Patron and Ordinary, for the Grant of a Parcel of Ground therein mentioned, lying in Stocks Market, to the said Mayor, Commonalty, and Citizens, in Consideration of a Rent of Ten Pounds a Year, payable to the said Rector and his Successors for ever." Ld. Griffin's Privilege; Buckby to be brought to the Bar, and Petition for Discharge to be considered. Upon reading the Petition of Thomas Buckby, of Great Bowden, in the County of Leicester, Yeoman, now in Custody of the Serjeant at Arms attending this House, for uttering contemptuous and defamatory Words of the Right Honourable the Lord Griffin; setting forth, "That, the Petitioner having unfortunately fallen under the Displeasure of the said Lord, his Lordship, in the Month of April 1736, caused an Action to be commenced and prosecuted against the Petitioner, for uttering several defamatory Expressions, which his Lordship laid to his Damage of £.5000. ; and the Petitioner pleading Not Guilty, believing he never spoke such Words, and (fn. 2) Notice of Trial was several Times given, but countermanded;" and further setting forth, "That the Petitioner is heartily sorry for incurring the Displeasure of the said Lord and this House; has made his Application for his Pardon, and that his Lordship would consent to his Discharge, being firmly resolved never to give Offence in any Kind for the future against the Privilege of this House; and praying to be discharged out of Custody:"
It is Ordered, That the Consideration of the said Petition be adjourned till To-morrow; and that the Petitioner be then brought to the Bar of this House, by the said Serjeant at Arms. Hodie 2a vice lecta est Billa, intituled, "An Act to enable Edward Mountfort and his Issue Male by Mary his now Wife to take and use the Surname of Grosvenor." Dominus Cancellarius declaravit præsens Parliamentum continuandum esse usque ad et in diem Jovis, septimum diem instantis Aprilis, hora undecima Auroræ, Dominis sic decernentibus. Brabazon against Lord Dudley and Ward. As was likewise, the Answer of Ambrose Farrell, to the Appeal of Roger O'Farrell. Bank of England against Lechmere & al. Henckell & al. against Lechmere & al. Weales & al. against Lechmere & al. Crawley & al. against Lechmere & al. And also, the Answer of the same Persons, to the Appeal of Theodosia Crowley and Joseph Gascoigne Nightingale. With a Bill, intituled, "An Act for making navigable the River Rodon, a little below a Mill called Barking Mill, in the County of Essex, to Illford Bridge, in the same County;" to which they desire the Concurrence of this House. Hodie 3a vice lecta est Billa, intituled, "An Act to vest the Estates of Frederick Trench Esquire, in the Counties of Westmeath and Meath, in the Kingdom of Ireland, in Trustees, to sell the same, for the Purposes therein mentioned." Hodie 3a vice lecta est Billa, intituled, "An Act for Sale of the Manor and Capital Messuage of Swallowfield, late the Estate of Thomas Pitt Esquire, deceased; and for purchasing another Estate, to be settled to the Uses of his Will." Hodie 2a vice lecta est Billa, intituled, "An Act for the Qualification of Persons acting as Trustees for repairing the Highways and Roads within that Part of Great Britain called England; for enlarging the Number of Trustees, and giving them Power to inspect, and take Copies of, Books and Accompts relating to such Highways and Roads." Ordered, That the said Bill be committed to a Committee of the whole House, on Tuesday Sevennight. Hodie 2a vice lecta est Billa, intituled, "An Act to enable John Harvey Esquire, now called John Thursby, to take and use the Surname and Arms of Thursby, in Pursuance of the Will of William Thursby Esquire, deceased." Their Lordships, or any Five of them; to meet on Monday the 28th Day of this Instant April, at the usual Time and Place; and to adjourn as they please. 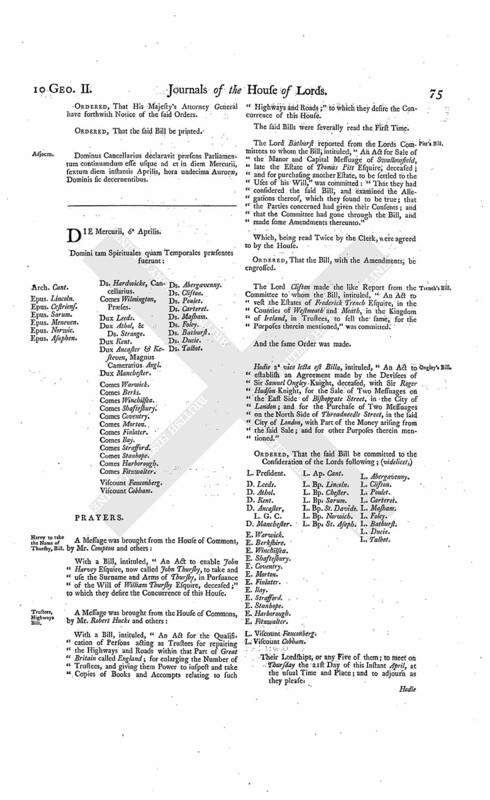 Ordered, That the Committee to whom the Bill, intituled, "An Act to enable Peter Legh, of Lyme, Esquire, to make a present Settlement on his Nephew Peter Legh the Younger, and his Issue Male, preferable to his own Issue Male; and to enable his said Nephew, and other Tenants for Life, to make Jointures and Provision for Daughters and Younger Sons, in the Life-time of the said Peter Legh the Elder, and with his Consent," stands committed, which was appointed to meet on Saturday next, do meet on the First Day after the Recess. Message from H. C. to return Cook's Bill. To return the Bill, intituled, "An Act for Sale of a certain Leasehold Estate of Thomas Cooke Esquire, in the County of Glocester; and for settling some Freehold and Copyhold Estates of Inheritance, of greater Value, to the same Uses, in Lieu thereof;" and to acquaint this House, that they have agreed to the same, with One Amendment, whereunto they desire their Lordships Concurrence. The House proceeded to take into Consideration the said Amendment. And the same, being read, was agreed to by the House. Respondents to De Gols's Appeal to answer peremptorily. The House was informed, "That the Respondents to the Appeal of Conrade de Gols Esquire, and John Read Gentleman, had not put in their Answer thereunto, though due Service had been made of the Order of this House for that Purpose." And thereupon Thomas Hale was called in; and attested upon Oath, at the Bar, the Service of the said Order. Ordered, That the Respondents to the said Appeal do peremptorily put in their Answer or respective Answers thereunto, in a Week. The House was informed, "That George Dowdale attended, in order to deliver in Copies of Proceedings, in the Cause wherein Edward Brabazon Esquire is Appellant, and William Lord Dudley and Ward Respondent." Upon reading the Petition and Appeal of Mary Aylmer, Widow and Relict of Garrett Aylmer, late of Lyons, in the County of Kildare, in the Kingdom of Ireland, Esquire, lately deceased; complaining of an Order of the Lord Chancellor of Ireland, made the 10th of December last, for an Attachment against the Appellant, for not delivering Michael Aylmer, an Insant, the only surviving Son and Heir Apparent of the said Garrett Aylmer and the Appellant, to William Alcock Esquire, appointed by his Lordship to be Guardian to the said Infant; and likewise complaining of another Order of the said Lord Chancellor, made the 21st of February last, for a Serjeant at Arms, and other Proceedings of his Lordship; and praying, "That the same may be reversed; and that the Appellant may have such further and other Relief as to the great Wisdom of this House shall seem meet:"
It is Ordered, That the said William Alcock may have a Copy of the said Appeal; and he is hereby required to put in his Answer thereunto, in Writing, on or before Thursday the 12th Day of May next; and that Service of this Order on the Respondent's Attorney or Clerk in the Court of Chancery in the said Kingdom be deemed good Service. Hodie 2a vice lecta est Billa, intituled, "An Act for confirming an Agreement between the Rector of the Parish Church of St. Mary Woolnoth, and of the united Parishes of St. Mary Woolchurch, in the City of London, and the Mayor and Commonalty and Citizens of the said City, by and with the Consent of the Patron and Ordinary, for the Grant of a Parcel of Ground therein mentioned, to the said Mayor, Commonalty, and Citizens, in Consideration of a Rent of Ten Pounds a Year, payable to the said Rector and his Successors for ever." Their Lordships, or any Five of them; to meet on Friday the 22d Day of this Instant April, at the usual Time and Place; and to adjourn as they please. The Earl of Finlater reported from the Lords Committees to whom the Bill, intituled, "An Act for continuing an Act passed in the Third Year of the Reign of His late Majesty King George the First, for laying a Duty of Two Pennies Scots, or One Sixth Part of a Penny Sterling, on every Pint of Ale or Beer that shall be vended or sold within the Town of Dumfries and Privileges thereof, for paying the Debts of the said Town, and for building a Church, and making a Harbour there; and for laying a Duty on the Tonnage of Shipping, and a Duty on Goods imported and exported into and out of the Port of the said Town, for the better repairing of the said Harbour," was committed: "That they had considered the said Bill, and examined the Allegations thereof, which they found to be true; and that the Committee had gone through the Bill, and directed him to report the same to the House, without any Amendment." His Lordship made the like Report from the Committee to whom the Bill, intituled, "An Act to enable Edward Mountfort, and his Issue Male by Mary his now Wife, to take and use the Surname of Grosvenor," was committed. Lord Griffin's Complaint referred to Committee; and Buckby bailed. Mr. Edward Benton, the Petitioner's Agent, was called in; and examined upon Oath, at the Bar, as to his Knowledge of the Allegations of the said Petition. And he acquainted the House, "That there had been Five Countermands of Notice of Trial given by Mr. Henry Harper, the Lord Griffin's Attorney, upon his Lordship's Action against the Petitioner, for defama tory Expressions; and that Mr. Philip Page, who has been formerly employed by the Petitioner, could give their Lordships a more full Account of the Matter." And the said Mr. Page was called in; and, being sworn, was examined in relation to the same Matter; and delivered in, at the Bar, the Process by Writ against the Petitioner, to make his Defence in the said Action, as also the Declaration against him. And the said Writ and Declaration were read, by the Clerk. Ordered, That the said Petition, together with the Matter of the said Lord Griffin's Complaint, be referred to the Lords Committees for Privileges; their Lordships to meet on the Second Monday after the approaching Recess; and that the Petitioner the said Thomas Buckby be discharged out of Custody; giving good Security to the Serjeant at Arms to render himself again, so as to appear before the said Lords Committees, at the Time aforementioned. Ordered, That the Lord Chancellor do write a Letter to the said Lord Griffin, to give him Notice, "That, upon Consideration of the said Petition, the House have ordered the same, together with the Matter of his Lordships Complaint, to be referred to the said Lords Committees; and that the Petitioner is ordered to be discharged, giving Security to render himself as aforesaid." Wilson, Lord Provost of Edinburgh, to be bailed. Upon reading the Petition of Alexander Wilson Esquire, Lord Provost of the City of Edinburgh, in Custody of the Gentleman Usher of the Black Rod; setting forth, "That he apprehends, should he be any longer kept under strict Custody, it will disable him from preparing what may be proper for his Defence, against the Bill brought in, to disable him to hold any Office of Magistracy in the said City; and also for his Imprisonment; and will greatly endanger his Health;" and praying, "That he may be discharged out of the said Custody, upon his giving sufficient Bail to appear when and where this House shall think fit:"
It is Ordered, That the Petitioner be admitted to Bail, by entering into a Recognizance of Two Thousand Pounds for himself, and likewise with Two Securities in One Thousand Pounds each, upon Condition that he shall personally appear before this House, at such Times as their Lordships shall proceed upon the said Bill, and at such other Times as he shall be required: And it is further Ordered, that it be referred to the Lords Committees this Day aforenamed, to consider of the Sufficiency of the Bail offered by the said Alexander Wilson, in his Petition, and report their Opinion thereupon to the House; their Lordships to meet on the First Day after the Recess. The House being moved, "That a Day may be appointed, for hearing the Cause wherein Edward Brabazon Esquire is Appellant, and William Lord Dudley and Ward Respondent." Dominus Cancellarius declaravit præsens Parliamentum continuandum esse usque ad et in diem Lunæ, decimum octavum diem instantis Aprilis, hora undecima Auroræ, Dominis sic decernentibus.